#NoDAPL: Is It Time for Water Protectors to Leave Standing Rock? 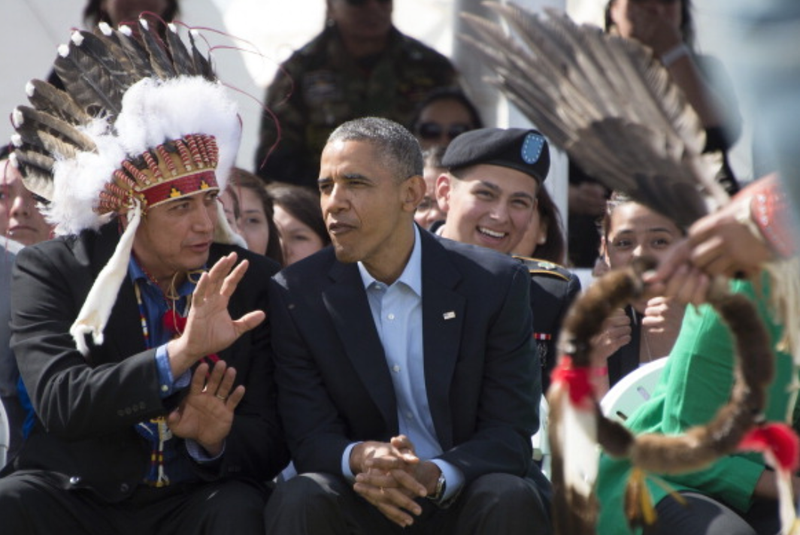 President Barack Obama (center) talks with Chairman of the Standing Rock Sioux Tribal Council David Archambault II during the Cannon Ball Flag Day Celebration in Cannon Ball, N.D., on June 13, 2014. After the U.S. Army Corps of Engineers announced Sunday that the Dakota Access Pipeline owners—Energy Transfer Partners, MarEn Bakken, Phillips 66 and Sunoco Logistics Partners—would not be granted easement to drill beneath Lake Oahe on the Missouri River, many water protectors at Standing Rock celebrated, but with the clear-eyed certainty that the fight is far from over. Standing Rock Sioux Tribal Council Chairman David Archambault II, however, has a different take: He wants anyone who isn't a member of the Standing Rock tribe to pack it up and leave the Oceti Sakowin (Seven Council Fires) Camp. Citing inclement weather as his primary concern, Archambault also warned that any water protectors committing a crime, such as hurting law enforcement or destroying equipment, could undermine all of their efforts to stop the pipeline. Let's be clear: the violence that has descended on Standing Rock has all been courtesy of law enforcement's rubber bullets, water cannons, attack dogs and tear gas trained on water protectors. One of the most heinous examples is what happened to Sophia Wilansky, 21. The water protector from the Bronx, N.Y., may lose her arm after being hit by a concussion grenade. The tribal chairman's words have reportedly caused some confusion and disappointment among those gathered at the Oceti Sakowin. "A lot of folks were still celebrating," said MPR News correspondent Doualy Xaykaothao, reporting from the camp. "The idea that people should go home after such a victory, obviously there's some disappointment here." Archambault said that he is willing to work with Trump and convince him that the Army Corps decision was the right one to make. "The tribe has been forgiving for over 200 years," he said. "We have to take the next step on this issue and get over it and start working together again." This approach seems futile, for good reason. Energy Transfer Partners CEO Kelcy Warren has been clear not only that Trump will pave the way for the pipeline but also that Warren himself doesn't give a damn about the water protectors or their ancestral land. "The people of the state of North Dakota are generally, generally wonderful people, law-abiding, nonviolent people. And they’re trying to go about their lives," Warren said. "This has been such a disruption to that state. "This is not a peaceful protest," he continued. "So if they want to stick around and continue to do what they’re doing, great, but we’re building the pipeline." Archambault's rush to declare victory before being certain that DAPL will, in fact, be rerouted away from Lake Oahe is not embraced by many people in the Standing Rock nation. In a video posted Dec. 6, Standing Rock member Chase Iron Eyes said that he respectfully disagrees with Archambault. Though it is critical that white colonial settlers leave indigenous sacred land upon request and not claim space for themselves, Iron Eyes has asked all water protectors to stay and stand with Standing Rock. In addition to saying that indigenous peoples from other tribes are welcome, he said, “Anybody from the Veterans Camp, anybody from Occupy [Wall Street], the feminist movement, from Black Lives Matter … there are literally 8,000 people at that camp right now. There is still currently a standing Eviction Order for the Oceti Sakowin Camp by the US Army Core [sic] and this could easily be used to pressure the camp to leave the Treaty land. If the numbers at camp go way down as I expect from these headlines and statements by even GreenPeace "claiming victory" it will be easier to attempt to force the remaining Water Protectors out. I can see Morton County Sheriff and DAPL Private Security currently in the hills across the Cannonball River riding around. The monstrous militarized concrete barricades blocking the highway where police laughed as they aimed Water Cannons in below freezing temperatures at innocent people remain. The Concertina wire on Turtle Island and all throughout the hills remain. This can't be said enough: Not only was DAPL approved by the Army Corps of Engineers, but it was done despite clear treaty violations. On Sept. 30, 2014, Standing Rock Tribal Council leaders met with DAPL representatives and discussed living in a "national sacrifice area." “You must know we are Sitting Bull’s people," said former Standing Rock Sioux Councilwoman Phyllis Young. "You must know who we are. We sit on a previous military fort and we have survived that. And we have rebuilt on what was taken from us. We survived Wounded Knee, a massacre. We are survivors. We are fighters and we are protectors of our land. "We realize we are in a national sacrifice area; we have always been," Young continued. "The Black Hills are a part of our territory. National sacrifice so America could take the largest gold mine and take all the gold from our people." The Standing Rock leaders’ opposition to the Dakota Access Pipeline is clear and documented—despite Energy Transfer Partners' lies to the contrary. So why, then, did President Barack Obama minimize this humanitarian crisis, when not—at least publicly—ignoring it altogether? President Obama artfully dodged the question by saying, in part: "[S]ome of these issues are caught up with laws and treaties, so I can’t give you details on this particular case. I’d have to go back to my staff and find out how we’re doing on this one." Obama's apparent lack of knowledge, and continued silence on the issue as terror rained down on water protectors, is notable for several reasons. Jodi Archambault Gillette, sister of Standing Rock Chairman Archambault, was a key figure during both of Obama's terms in the White House (2009-2015). Jodi Gillette, far left, stands with President Barack Obama and first lady Michelle Obama (fourth and fifth from left respectively), and members of Gillette's family, including her parents, Dave Archambault I and Betty Archambault; brother Dave Archambault II, chairman of the Standing Rock Sioux Tribal Council; sisters Billi Hornbeck and Sunshine Archambault Carlow; and sister-in-law Nicole Thunder Hawk Archambault during the president's historic trip to Standing Rock Sioux Reservation in June 2014. Gillette served in various capacities, including senior policy adviser to the president for Native American affairs in the White House Domestic Policy Council; deputy assistant secretary to the assistant secretary—Indian affairs in the U.S. Department of the Interior; and deputy associate director of intergovernmental affairs at the White House. “I’m proud to have Native Americans serving with dedication and skill in my administration, including somebody I love—Jodi Gillette of the Standing Rock Sioux tribe,” Obama said in December 2014. Gillette is now policy adviser of government relations with the law firm of Sonosky, Chambers, Sachse, Endreson & Perry, LLP, a firm dedicated to representing the best interests of indigenous people, including never representing "non-Indian interests in Indian law matters." The firm has publicly spoken out against the Dakota Access Pipeline, but Executive Order 13490—Ethics Commitments prevents Gillette from lobbying President Obama in any formal capacity. Obama and first lady Michelle Obama paid a historic visit to Standing Rock in June 2014 and participated in Cannon Ball, N.D.'s Flag Day Celebration. While there, the president promised to uphold treaty obligations, respect indigenous sovereignty and give all children the future they deserve. When you met with our people on your campaign trail in Sioux Falls, South Dakota, you stated that you are a lawyer and understand treaty documents. You told us that you realized our treaties were violated and you would address these violations against our people if you became President. This was your word. … We stand under the Freedom of Religion Act of 1978 with our Pipe of Peace and the Treaty of 1851. Our protectors had no lethal weapons, but we were met with an army of lethal weapons. Chief Looking Horse went on to outline the brutality that nation elders faced at Standing Rock while protecting the water. Despite this, there are many in Indian Country who love the 44th president of the United States. As previously reported by The Root, the Obama administration agreed to pay $492 million to 17 American Indian tribes to settle lawsuits over the mismanagement of natural resources and other tribal assets. Obama also expanded health care for indigenous people with the Affordable Care Act. And he signed the Violence Against Women Reauthorization Act; domestic and sexual violence disproportionately affects indigenous women. He may well have been; it makes sense, then, that he wouldn't want a modern-day Wounded Knee to mar that legacy. Still, during a particularly intense round of police brutality at Standing Rock in November, Obama said that prioritizing indigenous lands and traditions is important but that he would "let [the situation] play out for several more weeks." Make no mistake: Standing Rock has been under siege. It is only because of the determination of water protectors that the aggressive attempts to destroy and occupy their land have not been successful. Ralph Zotigh and his son Dennis Zotigh, of the Kiowa, Dakota and Pueblo tribes, sing during a rally against the Dakota Access Pipeline on Sept. 13, 2016, at Lafayette Square in Washington, D.C. Activists held a rally calling on President Barack Obama to stop the Dakota Access Pipeline. What's Next at Standing Rock? Sioux Chairman Archambault's sudden move to evacuate the Oceti Sakowin Camp—while saying that he is "forever grateful" to Obama and declaring the fight over—is arguably premature and dangerous. Further, his stated willingness to work with Trump does not seem to be in keeping with the skepticism voiced by others at Oceti Sakowin. "This victory is, I think, a momentous occasion of feeling the power of the people, but at the same time we are very aware that the next president coming in is in support of Dakota Access and will probably, you know, just cancel whatever environmental-impact statement is in progress and attempt to push this pipeline through," said Tara Houska, Ojibwe from Couchiching First Nation, who is national campaigns director for Honor the Earth, on Democracy Now. "And that’s where I think, you know, it’s really incumbent upon us to remain vigilant, to recognize the power that’s within us of organizing and coming together." Native Americans march to the site of a sacred burial ground that was disturbed by bulldozers building the Dakota Access Pipeline, near the encampment where hundreds of people have gathered to join the Standing Rock Sioux tribe's protest of the oil pipeline, on Sept. 4, 2016, near Cannon Ball, N.D.
As one of Standing Rock's council members said during the 2014 meeting to discuss the Dakota Access Pipeline, "We can live without oil, we can live without money, but we can't live without water." While Archambault wants water protectors to believe that the fight is over, there are many people at Standing Rock who will not be moved. They call Oceti Sakowin Camp—now a budding town of 8,000 people—home. And it is clear that the coming days of celebration, confusion and caution will likely be pivotal as they plan their next moves against the "black snake" slithering toward them—a snake deployed by the genocidal capitalist forces that still, after thousands of years, are trying to steal the land from beneath their feet.